by Capuzzi, David; Stauffer, Mark D.
Note: This is the bound book only and does not include access to MyCounselingLab® with Pearson eText. To order MyCounselingLab® with Pearson eText packaged with the bound book, use ISBN 0134280989. 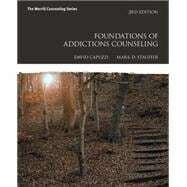 A practical collection of tools and strategies for prospective addictions counselors that includes a solid foundation of research, theory, and history .